My Daily Knit: Leaving for CA! Yes! I am leaving tomorrow morning for California. 4 days of work, followed by 5 days of play. The stress of getting ready is intense. 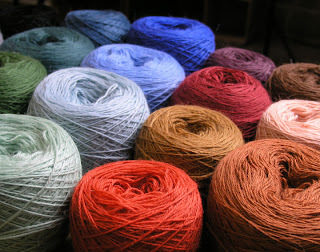 Especially deciding what knitting project(s) to bring. Bear in mind that we have shipped many, many yarn samples already, and that I'll have access to all that yarn should I run out... One never knows. Best be prepared than risk the chance to go into major withdrawal. Know what I mean? Yes, I knew you would. It will be a sophisticated 20-inch wide stole. The off white background is a finished scarf. Love it. 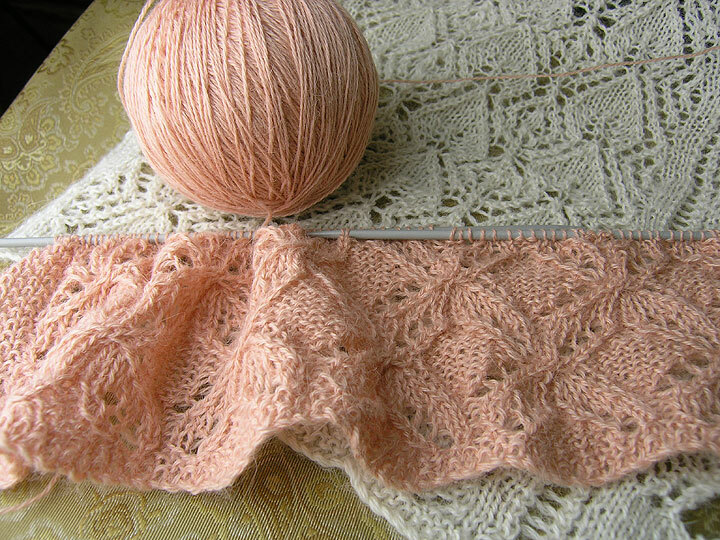 Cria Lace is the yarn used. It is not yet available (it is a new yarn for fall), but we will have our stock (so we can ship to yarn stores) around the end of February. I will make a BIG effort to have these patterns ready to go around that time too, so that I may satisfy the "sweet knitting" tooth of all. Back to packing. I may need a 2nd suitcase...just for yarn and assorted knitting paraphernalia. Love the pattern. Cannot wait til you publish it. Very pretty lace pattern and so pretty in pink. Do you have a name for it yet? I want some way to remember it until it gets published. Yes, it is named Clara Bows Stole. It is all done and will be photographed and published in about 2-3 weeks.